Moving through the world, he has taken on many roles. Some of these he’s chosen, some were forced upon him. Now he has come to a place in his life where he can decide for himself which of these he wants to keep and which he wants to discard. At any moment he can choose to step into any of his possible selves and immediately embody all of its attendant traits and characteristics. 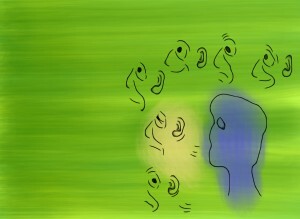 This entry was posted in Art, Featured, iPad Art, Writing and tagged iPad Art.